The Alexander von Humboldt Foundation recently invited to North-West University (NWU) research professor Erhabor Idemudia for a research stay in recognition of his academic achievements and cooperation with German specialists. The foundation typically extends these invitations to establish new contacts and to intensify cooperation between the selected person and scientists in Germany. 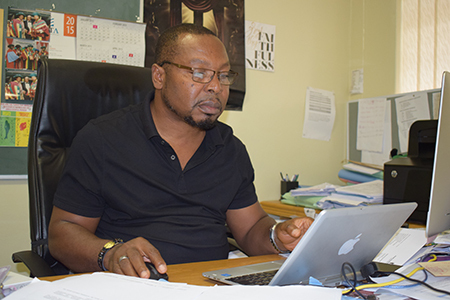 During his six month research stay, Prof Idemudia will also have to opportunity to work with German colleagues on a book – African migrations to EU Countries. The Alexander von Humboldt Foundation was established by the government of the Federal Republic of Germany and promotes international academic cooperation between excellent scientists and scholars from Germany and from abroad. It is funded by the Federal Foreign Office, the Federal Ministry of Education and Research, the Federal Ministry for Economic Cooperation and Development, as well as other national and international partners. Prof Erhabor Idemudia will be joining the Alexander von Humboldt Foundation in March 2019 for a six month research stay.